Ectopic formation of secondary lymphoid tissue is initiated by the local attraction of naive T and B cells. In this study, we describe a novel type of organized lymphoid structure in the lung of human idiopathic pulmonary fibrosis, with key features of lymphoid neogenesis, including: 1) recently activated CD40 ligand (CD40L)+ T cells; 2) variable numbers of activated CD40+/CD40L+ B cells, sometimes organized in follicles; 3) fully mature dendritic cells (DC) expressing CD40, CD83, CD86, and DC-lysosome-associated membrane protein; 4) the expression of the chemokine CCL21; 5) the presence of vessels with characteristics of high endothelial venules; and 6) a dense network of follicular DC. Surprisingly, these structures are devoid of CCR7+ naive T cells, proliferating lymphocytes, and germinal centers, suggesting that newly recruited activated DC and Ag-experienced lymphocytes can drive lymphoid neogenesis and that factors present within the lymphoid aggregates, such as CD40L, are essential to induce DC maturation. Lymphoid neogenesis has been linked to chronic inflammation in several mouse models and human diseases (1). The chemokine CCL21 has been shown to play a central role in this process by recruiting CCR7+ naive CD4+ T cells, which subsequently produce lymphotoxin α and αβ (2). Ectopic expression of CCL21 or lymphotoxin is sufficient to induce de novo lymphoid formation (3, 4). Ectopic lymphoid structures contain germinal centers with proliferating B cells, which, along with the presence of naive T cells, are believed to be essential for lymphoid neogenesis (5, 6). Such organized tertiary lymphoid structures are found in autoimmune diseases and in some infectious diseases or tumors, in response to recognition of self-Ags, invading pathogens, or neoplastic transformation (1). Chronic inflammation can occur in other pathological processes in the absence of a characterized infectious or autoimmune origin, but de novo formation of lymphoid tissue in these disorders remains to be clearly established. Idiopathic pulmonary fibrosis (IPF)4 is a chronic diffuse interstitial lung disease of unknown etiology characterized by persistent inflammation and enhanced collagen deposition in lung parenchyma (7). It has long been believed that IPF is a process of chronic repair resulting from persistent inflammation, but recently, the relative role of inflammation in the fibrotic process has been challenged (8, 9). This remains a matter of debate since pulmonary inflammation has been demonstrated in the early stage of the process in established IPF (10) and, strikingly, in clinically unaffected family members in the familial form of the disease (11). Inflammatory changes characteristic of chronic inflammation are observed in IPF lung, presenting as accumulation of lymphocytes organized in follicles, sometimes with the appearance of germinal centers (12, 13). This suggests that lymphoid neogenesis could occur in IPF lung, but lymphoid follicles observed in IPF have never been characterized. In this context, we undertook a systematic analysis of the cellular and molecular components characterizing chronic inflammation and lymphoid neogenesis in human IPF. We show that lymph node-like structures are present in IPF lung, including lymphoid follicles made of activated B cells, CD40 ligand-expressing activated T cells, fully mature dendritic cells (DC), and a network of follicular DC (FDC). The chemokine CCL21 is expressed in these lymphoid structures by endothelial cells of vessels resembling high endothelial venules. Surprisingly, CCR7+ naive T cells are absent from these structures, and B and T cells do not proliferate, reinforcing the concept that pulmonary lymphocytes are basically nondividing, preactivated memory cells (14, 15). Our results provide the first evidence of lymphoid neogenesis in IPF, showing that this process is not restricted to classical autoimmune diseases. They also provide evidence that lymphoid neogenesis in IPF is fundamentally different from that usually observed in chronic inflammation and that an ectopic organized lymphoid structure can persist and potentially chronically sustain inflammation in the absence of local lymphocyte proliferation. Such mechanism could be involved in the maintenance of other chronic or fibrotic disorders of unknown origin. Lung tissue samples were obtained by open lung biopsy (n = 7) or at the time of lung transplantation (n = 5) from 12 patients with IPF (9 men, 3 women; median age, 55 years (range, 44–69 years]) 8 smokers, 4 nonsmokers). IPF was diagnosed according to the American Thoracic Society/European Respiratory Society consensus criteria (7), including the characteristic morphology of usual interstitial pneumonia. All patients showed a restrictive functional pattern. At the time of lung biopsy, two patients were treated with oral corticosteroids and one patient was receiving low-dose hydrocortisone to treat adrenal insufficiency. Lung tissue samples obtained from five patients (four men, one woman; median age, 60 years (range, 52–69 years); four smokers, one nonsmoker) who underwent thoracic surgery for localized primary lung carcinoma were used as controls. Lung tissue was taken at a site distant from the lesion and was grossly normal. Microscopic examination demonstrated that lung tissue from the nonsmoking control was histologically normal, whereas biopsies from smokers showed the accumulation of pigment-laden macrophages and mild focal fibrotic changes associated with moderate alveolar epithelial cell hyperplasia. This study was approved by the local ethics committee, and patients gave their informed consent before lung surgery. mAbs to CD83 (HB15a) and CD208 (DC-LAMP) were obtained from Immunotech. mAbs to CD4 (MT310), CD8 (DK25), CD20 (L26), CD45RO (OPD4), and CNA42 (M7157) were obtained from DakoCytomation. mAbs to CD3, CD28 (CD28.2), CD40 (5C3), CD45RA (L48), CD86 (IT2.2), and CCR7 were obtained from BD Biosciences. mAbs to MIP-3β (CCL19), stromal cell-derived factor 1 (CXCL12), CCR4, CCR6, and CXCR4 and goat polyclonal Abs to CD40L, MIP-3α (CCL20), and 6Ckine (CCL21) were obtained from R&D Systems. Goat polyclonal Ab to macrophage-derived chemokine (CCL22) and rabbit polyclonal Ab to CCR4 were obtained from Santa Cruz Biotechnology. Fragments of lung tissue samples were immediately frozen and stored in liquid nitrogen. Serial 4- to 6-μm-thick cryostat sections fixed in acetone were used to perform immunohistochemical techniques. Sections were reacted with appropriate dilutions of Ab. Positive cells were revealed using the Vectastain ABC-alkaline phosphatase kit system (Vector Laboratories) and the fast red substrate. Double labeling was performed using successively the Vectastain ABC-peroxidase and ABC-alkaline phosphatase kits. To test the specificity of immunostaining, Abs were omitted or replaced by an isotype-matched control Ab. Tonsil tissue was used as a positive control. On adjacent sections, positive cells with a characteristic dendritic morphology were evaluated by two independent observers in 10 different high-power fields at ×250 magnification, and results were expressed as the number of positive cells per square millimeter of lung tissue. Results are presented as median (range) values. Differences between fibrotic and control lung samples were determined using the Mann-Whitney U test. Correlations were assessed with the Spearman rank-order test. A value of p < 0.05 was considered to be significant. Histological and immunohistological examination was initially used to analyze the inflammatory infiltrate in lung biopsies from 12 patients with IPF. All samples examined displayed characteristic lesions of IPF (16). A moderate to important infiltration by lymphocytes was observed in all lesions. Lymphocytes predominated close to blood vessels where they were organized in aggregates of variable size and number, sometimes with the appearance of germinal centers. Although smaller and less numerous, aggregates were also observed in the two patients treated with corticosteroids. On serial sections, aggregates were found to be mainly composed of CD3+ T lymphocytes (Fig. 1⇓A). In 7 of 12 cases, variable numbers of CD20+ B lymphocytes were also present. In these cases, a structural organization reminiscent of that of the lymph node was observed, with separate cords of T and B lymphocytes. B lymphocytes were clustered at the center of the largest aggregates (Fig. 1⇓, B and C). Also comparable to lymph nodes, mature DC expressing CD40, CD86, CD83, or DC-LAMP, although virtually absent in control lung, were consistently observed within the T cell areas of lymphocyte aggregates (Fig. 2⇓). Whereas organized aggregates associating B and T cells were found in only 7 of 12 cases, T cell aggregates infiltrated by mature DC were consistently observed in all fibrotic lungs. Interestingly, there was a positive correlation between the numbers of mature DC per square millimeter and the intensity of the lymphocyte infiltrate. Numerous CD31+CD34+ vascular structures were observed within aggregates (data not shown). Some of them were lined by large endothelial cells and resembled high endothelial venules (HEV) involved in lymphocyte trafficking (17). Characterization of lymphocyte aggregates. A, CD3+ T cell aggregate organized close to a blood vessel (bv). B–F, High-power views of adjacent sections of a lymphocyte aggregate associating T cells and B cells. Note the structural organization with peripheral CD3+ T lymphocytes (B) and a central core of CD20+ B lymphocytes (C). B lymphocytes express CD40 (D), whereas both T cells and B cells express CD40L (E). CD20 (red)/CD40L (brown) double labeling shows that B cells effectively express CD40L (F). A network of CNA42+ FDC infiltrate the B cell area (G). Very few lymphocytes are Ki67+ (H), whereas in the same section hyperplastic alveolar epithelial cells readily express this Ag (I) as do tonsillar germinal centers used as positive controls (J). Original magnification: A, ×125; and B–J, ×250. Immunodetection of mature DC in fibrotic lung. 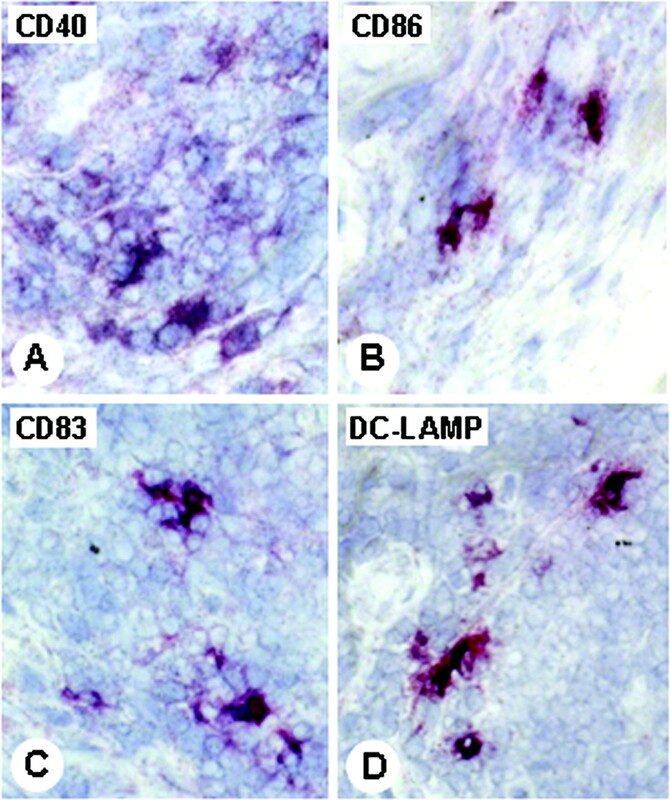 Representative areas of T cell aggregates showing the presence of DC intercalated between lymphocytes and expressing CD40 (A), CD86 (B), CD83 (C), or DC-LAMP (D). Original magnification, ×320. The local production of chemokines is a critical event in the formation of ectopic lymphoid tissue (1, 2, 3, 4, 5, 6, 18). CCL19 (MIP-3β) was found to be strongly expressed by lymphocytes within aggregates, mainly in areas where T cells and mature DC accumulated (Fig. 3⇓A). On adjacent sections, DC strongly positive for CCR7 were observed in the same areas (Fig. 3⇓B), suggesting DC recruitment via CCL19-CCR7 interaction. More importantly, blood vessels associated with lymphoid aggregates, including HEV-like vessels, expressed both CCL19 and CCL21 (6-Ckine) (Fig. 3⇓, A and C), suggesting recruitment of CCR7+ cells from the blood. CCL21 production was shown to be essential to the formation of ectopic lymphoid through the local attraction of CCR7+ naive CD4+ T cells (2, 6). Surprisingly, only rare lymphocytes were found to express CCR7 in our study, suggesting that T cells recruited to the aggregates were activated T cells having down-regulated CCR7 expression (18). In accordance with an activated phenotype, most lymphocytes expressed CCR4 (Fig. 3⇓E) and CXCR4 (Fig. 3⇓G). CCL22 (macrophage-derived chemokine), the cognate ligand of CCR4, was found to be strongly expressed by lymphocytes and by blood vessels in T cell aggregates (Fig. 3⇓D), as was CXCL12, a ligand for CXCR4 (Fig. 3⇓F). Overall, our data suggest that in IPF, CCL21 might attract CCR7+ maturing DC, whereas CCL22 and CXCL12 could play a key role in attracting recently activated CCR4+CXCR4+CCR7− T cells (19). Immunodetection of chemokines/chemokine receptors in lymphoid aggregates. Representative areas of T cell aggregates are shown. A, Note the strong expression of CCL19 by lymphocytes and by vessels associated with the aggregate (arrows). B, High-power view of a similar area showing DC intercalated between lymphocytes and strongly positive for CCR7, the receptor for CCL19. C, CCL21, the other ligand for CCR7, is expressed by some lymphocytes and by large endothelial cells lining small vessels, presumably HEV (arrows). A positive lymphatic vessel is seen on the upper right, close to the aggregate (arrowhead). D, CCL22 is strongly expressed by lymphocytes and endothelial cells. E, CCR4, the cognate receptor for CCL22, is expressed by most lymphocytes. F and G, Lymphocytes also express CXCL12 and CXCR4, respectively. Original magnifications: A, D, and G, ×250; B and C, ×400; and E and F, ×320. Since local chemokine/chemokine receptor expression suggested the attraction of activated lymphocytes, we further characterized the functional phenotype of these cells as well as the neighboring APC. T lymphocytes were mainly composed of CD4+ T lymphocytes, associated with variable numbers (∼20–30%) of CD8+ T cells. Interestingly, most T lymphocytes (80%) expressed a CD45RO+ memory phenotype and were CCR7 negative; they also expressed CD28, the receptor for CD86 costimulatory molecules expressed by mature DC (data not shown). A key feature of activated T cells in secondary lymphoid organs is the expression of CD40L, which is induced early after activation of the T cells and provides a strong maturation signal for DC (20). CD40L expression is generally thought to be restricted to lymphoid tissue. Accordingly, we found that the great majority of T cells in IPF lymphoid aggregates expressed CD40L (Fig. 1⇑E), further confirming the similarities between these lymphoid follicles and secondary lymphoid organs. Moreover, the vicinity of CD40L+ T cells and activated DC suggested that CD40L could induce locally the terminal maturation of newly recruited CCR7+ DC. Interestingly, CD40-CD40L interactions were essential in the pathogenesis of an autoimmune model of lung fibrosis (21), which, along with our data in human IPF, suggest that the CD40L pathway could be a potential therapeutic target. On adjacent sections, B cells were found to be organized in follicles resembling germinal centers and to express CD40 and CD40L (Fig. 1⇑, D–F). Networks of CNA42+ FDC were detected in these areas (Fig. 1⇑G). However, both T and B lymphocytes were nonproliferating (Ki67+ cells within aggregates ≤ 1%; Fig. 1⇑H). This lack of proliferation could not be due to an artifact, since in the same sections numerous epithelial cells expressed Ki67 Ag in areas of alveolar hyperplasia (Fig. 1⇑I), as did germinal centers in tonsils used as positive controls (Fig. 1⇑J); similar results were observed using antiproliferating cell nuclear Ag immunolabeling. Likewise, the lack of proliferation within IPF follicles could not be attributed to the hypoxic state of the patients, 5 of 12 of them being studied at the time of lung transplantation, since local lymph nodes from 4 of 5 patients taken when the lungs were transplanted showed normal germinal centers with typical levels of proliferation. These data suggested that lymphocytes accumulating in IPF lesions had already been activated when recruited to the lymphoid follicles. This is in complete agreement with the concept that lymphocytes resident in/or recruited to the lung are memory cells (14) that have recently been demonstrated to be completely unable to divide or migrate back to the lymph nodes (15). Interestingly, those activated T cells populating the lung remain fully competent with respect to effector cytokine production (14, 15). This strongly suggests that reactivation of memory T cells accumulating in IPF lesions by DC maturing locally, likely play a central role in sustaining chronic inflammation. In conclusion, despite the limits inherent to all human studies, our study provides new and important insight into the pathogenesis of IPF and the factors driving and maintaining lymphoid neogenesis. Early studies in IPF have emphasized the abundance of T and B lymphocytes, and the presence of lymphocyte aggregates resembling lymphoid follicles (12, 13). Our present data show that lymphocytes have characteristics of activated and Ag-experienced cells and that clusters of B cells are not true germinal centers given the absence of proliferating cells, despite the presence of FDC. Our data suggest that an ectopic organized lymphoid structure can persist in an autonomous fashion by recruiting maturing DC and recently activated T cells (22), and chronically sustain inflammation in the absence of local lymphocyte proliferation. It should be of great interest to determine whether this novel type of organized lymphoid structure observed in IPF could be involved in other chronic inflammatory or fibrotic processes of unknown origin. The observation that these organized lymphoid structures are constituted of activated and nonproliferating lymphocytes and DC could help explain why anti-inflammatory drugs are mostly ineffective in IPF, since these agents have a poor activity on differentiated effectors and especially mature DC (Ref. 23 and V. Soumelis, unpublished data). We suggest that novel therapeutic strategies should combine anti-inflammatory and antifibrotic agents and target mature DC and CD40-CD40L interactions, which could be central to the perpetuation of chronic lymphoid neogenesis in IPF. We thank Dr. Allan J. Hance for critical lecture of this manuscript and helpful discussion. ↵1 This work was supported by a grant from the Chancellerie des Universités de Paris (Legs Poix). Y.U. is the recipient of a grant from the Fondation pour la Recherche Médicale. S.M.A. is the recipient of a grant from the Fondation pour la Recherche Médicale (Prix Mariane Josso). P.S. is the recipient of a Contrat d’Interface Institut National de la Santé et de la Recherche Médicale-Assistance Publique/Hôpitaux de Paris. ↵2 J.M.-S. and Y.U. contributed equally to this work. ↵4 Abbreviations used in this paper: IPF, idiopathic pulmonary fibrosis; DC, dendritic cell; DC-LAMP, DC-lysosome-associated membrane protein; FDC, follicular DC; HEV, high endothelial venule; CD40L, CD40 ligand. Hjelmström, P.. 2001. Lymphoid neogenesis: de novo formation of lymphoid tissue in chronic inflammation through expression of homing chemokines. J. Leukocyte Biol. 69: 331-339. Wenninger, W., H. S. Carlsen, M. Goodarzi, F. Moazd, M. A. Crowley, E. S. Baekkevold, L. L. Cavanagh, U. H. von Andrian. 2003. Naïve T cell recruitment to nonlymphoid tissues: a role for endothelium-expressed CC chemokine ligand 21 in autoimmune disease and lymphoid neogenesis. J. Immunol. 170: 4638-4648. Luther, S., A. A. Bidgol, D. C. Hargreaves, A. Schmidt, Y. Xu, J. Paniyadi, M. Matloubian, J. G. Cyster. 2002. 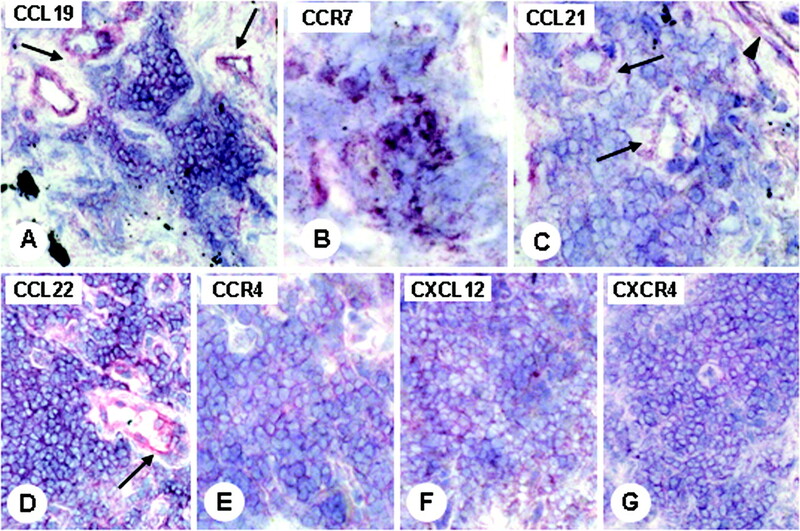 Differing activities of homeostatic chemokines CCL19, CCL21, and CXCL12 in lymphocyte and dendritic cell recruitment and lymphoid neogenesis. J. Immunol. 169: 424-433. Drayton, D. L., X. Ying, J. Lee, W. Lesslauer, N. H. Ruddle. 2003. Ectopic LTαβ directs lymphoid organ neogenesis with concomitant expression of peripheral node addressin and a HEV-restricted sulfotransferase. J. Exp. Med. 197: 1153-1163. Luther, S. A., T. Lopez, W. Bai, D. Hanahan, J. G. Cyster. 2000. BLC expression in pancreatic islets causes B cell recruitment and lymphotoxin-dependent lymphoid neogenesis. Immunity 12: 471-481. Weyand, C. M., P. J. Kurtin, J. J. Goronzy. 2001. Ectopic lymphoid organogenesis. Am. J. Pathol. 159: 787-793. American Thoracic Society/European Respiratory Society International Multidisciplinary Consensus. 2002. Classification of the idiopathic interstitial pneumonias. Am. J. Respir. Crit. Care Med. 165: 277-304. Gauldie, J.. 2002. Inflammatory mechanisms are a minor component of the pathogenesis of idiopathic pulmonary fibrosis. Am. J. Respir. Crit. Care Med. 165: 1205-1208. Strieter, R. M.. 2002. Inflammatory mechanisms are not a minor component of the pathogenesis of idiopathic pulmonary fibrosis. Am. J. Respir. Crit. Care Med. 165: 1205-1208. Crystal, R. G., P. B. Bitterman, S. I. Rennard, A. J. Hance, B. A. Keogh. 1984. Interstitial lung diseases of unknown cause: disorders characterized by chronic inflammation of the lower respiratory tract (first of two parts). N. Engl. J. Med. 310: 154-166. Bitterman, P. B., S. I. Rennard, B. A. Keogh, M. D. Wevers, S. Adelberg, R. G. Crystal. 1986. Familial idiopathic pulmonary fibrosis: evidence of lung inflammation in unaffected family members. N. Engl. J. Med. 314: 1343-1347. Campbell, D. A., L. W. Poulter, G. Janossy, R. M. du Bois. 1985. Immunohistological analysis of lung tissue from patients with cryptogenic fibrosing alveolitis suggesting local expression of immune hypersensitivity. Thorax 40: 405-411. Wallace, W. A., S. E. Howie, A. S. Krajewski, D. Lamb. 1966. The immunological architecture of B-lymphocyte aggregates in cryptogenic fibrosing alveolitis. J. Pathol. 178: 323-329. Agostini, C., M. Chilosi, R. Zambello, L. Trentin, G. Semenzato. 1993. Pulmonary immune cells in health and disease: lymphocytes. Eur. Respir. J. 6: 1378-1401. Harris, N. L., V. Watt, F. Ronchese, G. Le Gros. 2002. Differential T cell function and fate in lymph node and nonlymphoid tissues. J. Exp. Med. 195: 317-326. Katzenstein, A. A., J. L. Myers. 1998. Idiopathic pulmonary fibrosis: clinical relevance of pathologic classification. Am. J. Respir. Crit. Care Med. 157: 1301-1315. Sallusto, F., C. R. Mackay, A. Lanzavecchia. 2000. The role of chemokine receptors in primary, effector, and memory immune responses. Annu. Rev. Immunol. 18: 593-620. Tang, H. L., J. G. Cyster. 1999. Chemokine up-regulation and activated T cell attraction by maturing dendritic cells. Science 284: 819-822. Zhang-Hoover, J., A. Sutton, J. Stein-Streilein. 2001. CD40-CD40 ligand interactions are critical for elicitation of autoimmune-mediated fibrosis in the lung. J. Immunol. 166: 3556-3563. Sallusto, F., A. Lanzavecchia. 1999. Mobilizing dendritic cells for tolerance, priming, and chronic inflammation. J. Exp. Med. 189: 611-614. Matyszak, M. K., S. Citterio, M. Rescigno, P. Ricciardi-Castagnoli. 2000. Differential effects of corticosteroids during different stages of dendritic cell maturation. Eur. J. Immunol. 30: 1233-1242.